At first glance, Rosewater’s setting, its mixture of mysticism and science, and its overall themes—communication, trust, the unknowable alien and irreversible transformations—recalls the work of another award-winning author of Nigerian extraction: Nnedi Okorafor’s acclaimed Lagoon (Hodder, 2014; Saga Press, 2016). But in terms of structure, characterisation, and tone, Rosewater’s an entirely different beast. 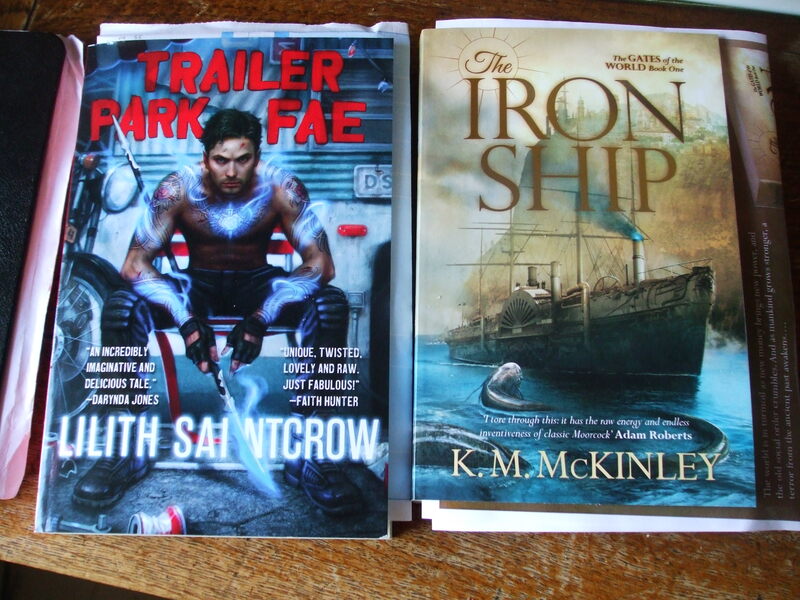 It reminds me a little of Elizabeth Bear’s Jenny Casey trilogy, and a little, too, of Ian McDonald. It’s not really into soft edges. Dreadful Company is Vivian Shaw’s second book, sequel to last year’s excellent Strange Practice. And if anything, it’s even more fun. This is an interesting novel, a compelling and entertaining read. But it’s also a novel engaged in—in conversation with—political dialectic about change and systems of power, and on that count, it doesn’t examine nearly enough of its assumptions. 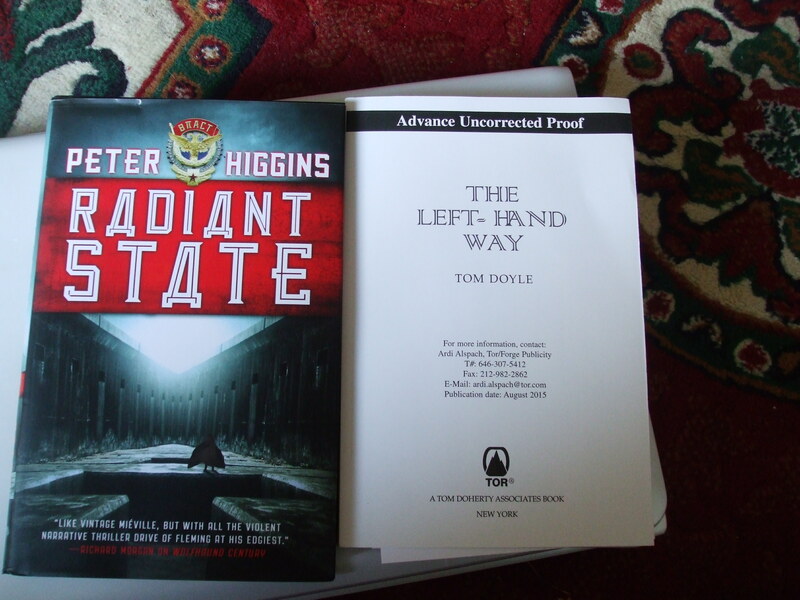 Courtesy of Orbit, Peter Higgins’ RADIANT STATE. Courtesy of Tor, Tom Doyle’s LEFT HAND WAY. James S.A. Corey, Caliban’s War. Orbit, 2013 (2012). Caliban’s War is the second novel in Corey’s “Expanse” series. All things considered, it is a much stronger novel, doing a number of things that interest me much more, than its predecessor. Caliban’s War builds on the setting of Leviathan Wakes, but its pacing is much stronger, and the three new viewpoint characters added to Holden’s are much more interesting than the Holden-and-Miller show of Leviathan Wakes. Give me the POV of cranky old-lady super-politician-diplomats and badass female marines and my investment in a narrative goes well up, is what I’m saying. And Prax, the scientist whose search for his missing daughter drives a good section of the narrative, is a pure delight to read. Holden remains, unfortunately, boring in the square-jawed American-hero way. Fortunately the characters around him are much more interesting. It strikes me that this makes two books in a row in this series where the search for a missing female person has played a significant role in the development of the narrative. I wonder if that’s going to be an ongoing pattern? This is a stronger book than its predecessor, and I’m glad I read it. 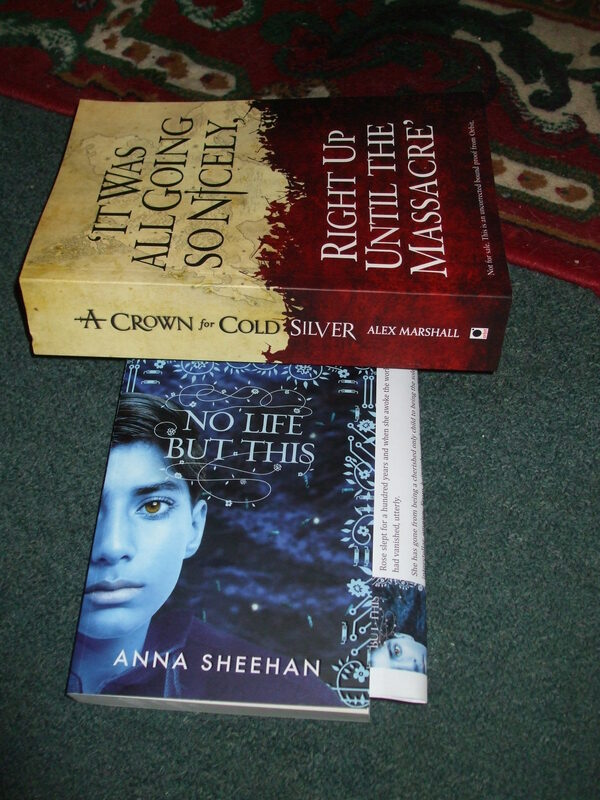 It is also making me a convincing argument to keep reading: things exploded very entertainingly here. I have a Patreon now. Please consider supporting. My photography skills are terrible, yes, I know. 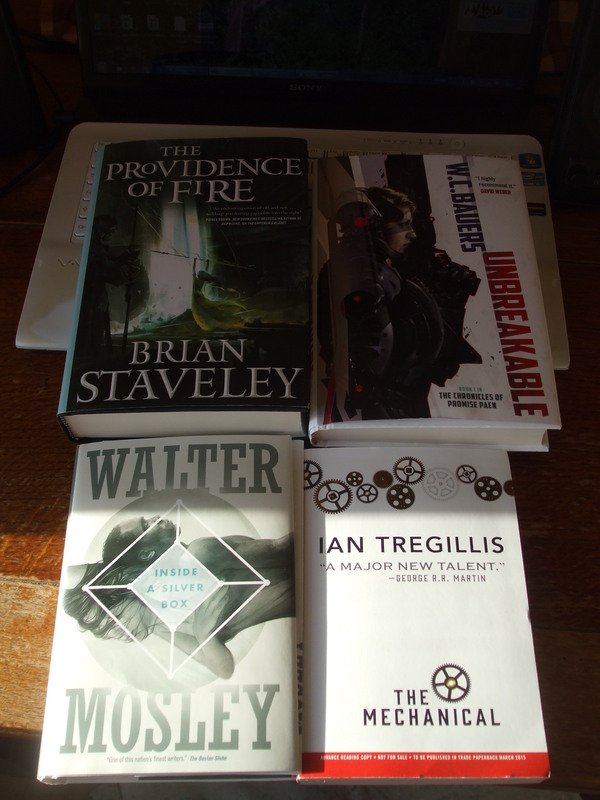 Courtesy of Tor: Brian Staveley’s THE PROVIDENCE OF FIRE, W.C. Bauers’ UNBREAKABLE, and Walter Mosley’s INSIDE A SILVER BOX. Courtesy of Orbit: Ian Tregillis’ THE MECHANICAL. Weston Ochse, Seal Team 666. 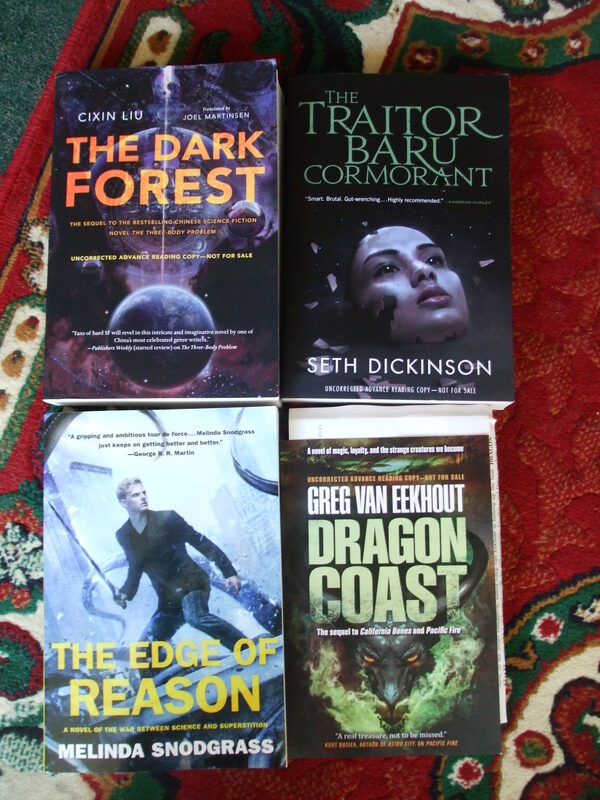 Titan Books, 2013. Copy courtesy of Titan Books. This book’s prologue begins with a thinly-disguised fantasy fictionalisation of Seal Team 6’s assassination of Osama bin Laden, in which the unnamed bin Laden figure is portrayed as sincerely and knowingly in league with demonic forces. And when continuing on from that in the next chapter, there was no attempt at explaining why there’d be demons involved, and it also proved rather dull – well, I have a lot of other things to read. A lot. So I stopped, and I do not intend to go back. Jon Courtenay Grimwood, The Outcast Blade. Orbit, 2012. 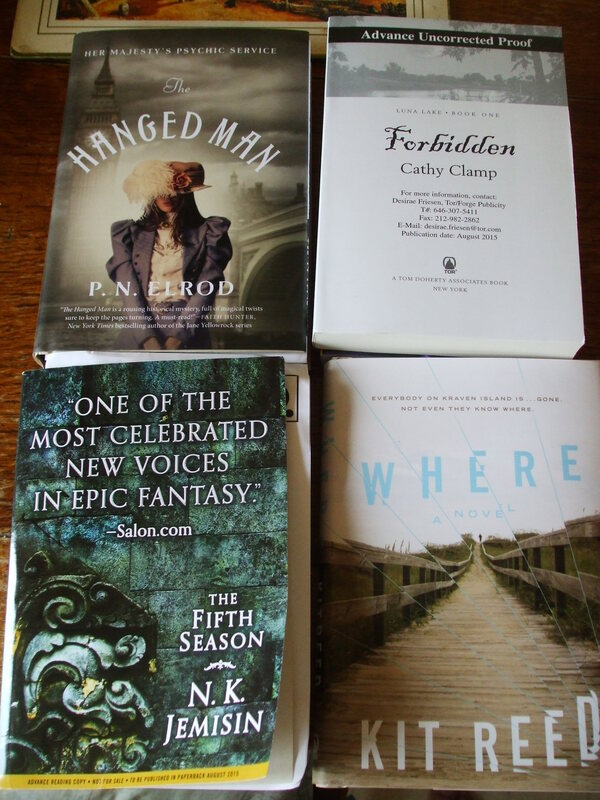 I may rag on “grimdark” fantasy a lot, but I like a good bit of gritty darkness as much as the next person – as long as it’s leavened with moments of emotional warmth and somewhat ethical choices. In The Outcast Blade, sequel to The Fallen Blade, JCG continues the story of Tycho, ex-slave turned knight, a trained assassin who craves blood under the moon; the sixteen-year-old noblewoman Giulietta, widow, key political pawn – or player – and the dark and troubled Venice of this alternate, fantastical, 16th-century Venice. It’s a very good, very tightly written book. It never forgets the agency of its women, and its Venice is home to a wide range of people – Mongols and Mamlukes, rabbis and gravediggers, noblewomen and street children. I enjoyed it a lot, and I anticipate its soon-to-be-published sequel with some eagerness.